Hey check this out!!! 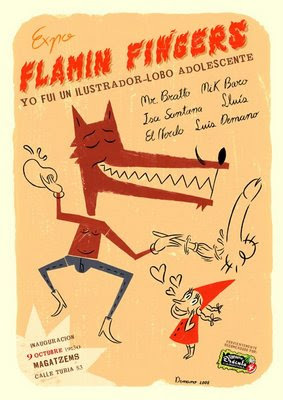 this a group exhibition called The Flamin Fingers - I was A Teenage Warewolf Ilustrator-. The exhibition includes Mr Bratto, Mik Baro, Isabel Santana, El Nerdo, Luis Demano & myself. Those of you who will be in Valencia for the Funtastic Dracula Carnival!!! where the Mummies are playing!!!! Don't miss the opening, there you will be able to see, the original drawings of some of your favourite record covers!!! Rock 'n' Roll posters, Tattoo designs, and weird paintings... also Mr Bratto will be slappin on the records like there was no tomorrow!! to get you jivin'!!! so don't miss out!!! from the 9th of Octubre untill the 9th of November, 2008.